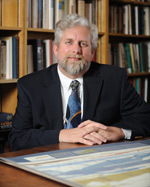 John R. Neff joined the faculty at the University of Mississippi in 1999. With a research focus in Civil War memory, he was delighted to be invited to participate in the placing of a monument to the Eleventh Mississippi Infantry Regiment at Gettysburg National Military Park in 2000. His first book, Honoring the Civil War Dead: Commemoration and the Problem of Reconciliation, appeared in 2005 from the University Press of Kansas. That year, he was also named the College of Liberal Arts Teacher of the Year, and in 2009 he received the Elsie B. Hood Outstanding Teacher Award. He is currently at work on research into the legacy of the Civil War in Chicago, a project tentatively entitled City of Memory. Dr. Holm is a historian of the United States in the Civil War era, with a particular focus on the border states, sectionalism, and religion. Her work concerns the intersection of the moral and religious with the political. She is currently revising her dissertation, “A Kingdom Divided: Border Evangelicals in the Civil War Era.” Dr. Holm received her Ph.D. from Columbia University in 2010 and spent a year as a Schwartz Postdoctoral Fellow at the New School and The New-York Historical Society. She joined the faculty of the University of Mississippi in 2011. The Center is particularly fortunate to be able to rely on the counsel and advice of a truly outstanding Advisory Board. The following individuals have contributed their time and expertise to the creation and maintenance of our Center website: Noah Arnold, Eli Baker, Andrew Davis, Amy Fluker, Boyd Harris, Tony Klein, Amanda Nagel, Christine Rizzi, Audrey M. Uffner, Hunter Upchurch, LeeAnn Whitely. African American Civil War Memorial, Washington D. C.
Photo courtesy of Leon Reed / Flickr. Used with permission. New York Irish Brigade Monument, Gettysburg National Military Park. Photos courtesy of Julie Rentsch / Flickr. Used with permission. Sherman Monument, Central Park, New York City. Photo courtesy of Peter Law / Flickr. Used with permission. First Pennsylvania Cavalry Monument, Gettysburg National Military Park. Photos courtesy of Ron Zanoni / Flickr. Used with permission. Iowa State Monument, Shiloh National Military Park. Photo courtesy of Pat Neff. Used with permission. All other color photos, John R. Neff.